Address: Urbanización Los Pocillos, Calle Noruega, 2, Puerto del Carmen (Lanzarote), Islas Canarias. 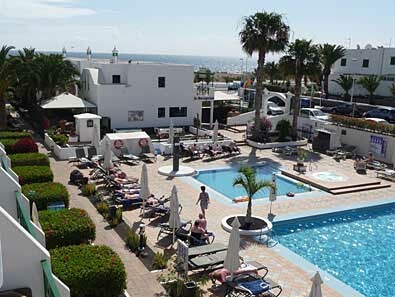 Club del Carmen is 2 minutes' walk from Lanzarote’s Playa Grande and Playa Chica beaches. There is a terrace with a large swimming pool and a hot tub. All apartments at this well-equipped resort have a small terrace. The nearby sea is ideal for water sports. Wi-Fi is available at an extra cost. The kitchen includes a microwave, fridge, dishwasher, an oven, a toaster and a coffee machine. Kitchen utensils and dishes are also included. The full bathroom has a bath and shower and a hairdryer. The open-plan living room/kitchen also offers a DVD player and satellite TV. The property has an on-site restaurant and poolside bar, playground, outdoor pool table and table tennis, and it is set amid gardens. Club del Carmen has several sun terraces. The resort is a short walk from the shops, bars and restaurants on the Paseo Marítimo. You can park in the streets surrounding the resort. This property will not accommodate hen, stag or similar parties. A damage deposit of EUR 100 is required. The host charges this 7 days before arrival. This will be collected by credit card. You should be reimbursed within 14 days of check-out. Your deposit will be refunded in full via credit card, subject to an inspection of the property. Guests are required to show a photo identification and credit card upon check-in. Please note that all Special Requests are subject to availability and additional charges may apply. Restaurant is closed from Tue 15 Oct 2019 until Sun 15 Dec 2019 When booking 5 rooms or more, different policies and additional supplements may apply. Please contact the property in advance for details. Children of all ages are included in the maximum occupancy of the apartments. A refundable security deposit of €100 per apartment is required upon arrival. This deposit is obligatory and must be paid with a valid debit or credit card. Cash is not accepted. Guests who are unable to provide the deposit will not gain entry to the apartment.